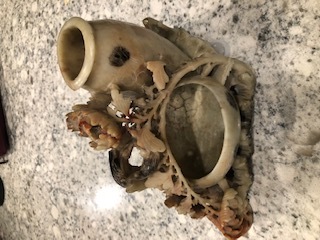 I am trying to find help to identify a Chinese Carved ornate vase. It has been in my family for at least 4 generations and is definitely old. It may be jade and appears to be hand carved. It is heavy too. I would love help to know if it is Jade and real. Is there anyone who can either help me figure this out? I have inserted a photo and inside of the bottom bowl there was some kind of marking or number that looks like 1116. Any help is appreciated.